There is never a dull moment–even at an airport–when the Wake-Up Crew and Hawaiian Tel FCU are involved! Vacations Hawaii did their part by making sure all of our members and guests arrived at the proper gate. From there, Krey-Z Oshiro used the airport microphone to announce that we had Zippy’s Zip Pacs for every member at the gate! With their delicious Zip Pacs, members and guests got a BINGO card and credentials to attend all the activities we planned for the trip. Top: Gregg Hammer and Krey-Z Oshiro of the Wake-Up Crew are ready for take off! Middle: Our Vacation’s Hawaii Omni plane is ready at our gate! Bottom: The HiTel Crew is enjoying their Zippy’s Zip Pacs! We arrived in Las Vegas close to 11 PM. Everyone was exhausted, so some people retired to their rooms while others tried their luck at the slots and card tables! 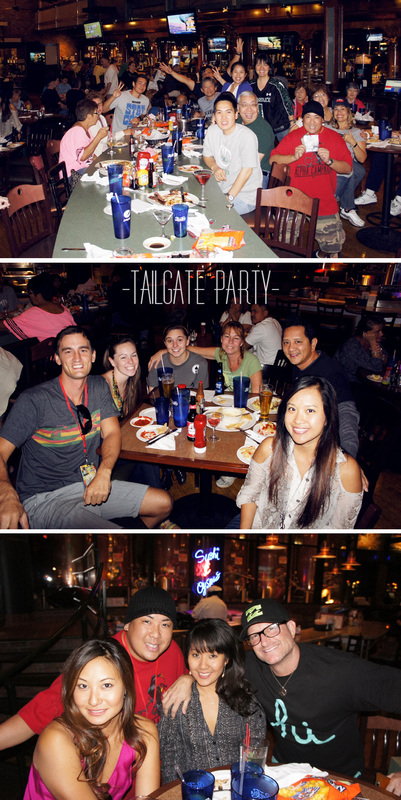 The next evening we had a tailgate party at the Triple 7 Restaurant and Brewery. Triple 7 is a great place that serves up All-American snacks like buffalo wings, nachos, sliders, and more! We had a great time filling up on pupus, chatting about the game, and of course cheering on our favorite teams! Top: A portion of the group gathers for a photo! Bottom: Krey-Z and friends are excited to watch the game! The shopping trip was not for the faint of heart. From 8:45 AM we were going non-stop! After a quick photo-opt in front of the famous Las Vegas sign, we made it to our first stop, Ethel M’s Chocolate Factory. At the factory we watched as machines covered truffles, nougat, and caramel with silky chocolate. We had a chance to taste test their white, milk, and dark chocolate, and also their peanut butter brittle. After Ethel M’s, the group enjoyed freshly baked goods from Diamond Bakery while playing BINGO on the way to our next stop, the Las Vegas Premium Outlet South. The Premium Outlet mall has over 140 stores including Ann Taylor, Kenneth Cole, and Coach! After about an hour of shopping at the Premium South, we got back on the bus, enjoyed pretzel dogs from The Pretzelmaker and headed to Trader Joe’s just across the street! Trader Joe’s is a great place to find one of a kind omiyage like Snow Pea Crisps, Butter Wafer Cookies, Nutty Bits, and so much more. As soon as we got to Trader Joe’s everyone raced off the bus and made most of their time in the crowded store. Our next stop was the Fantastik Indoor Swap Meet. The swap meet is contained completely indoors (like its name implies) and is full to the brim with little shops selling everything from feathered boas to live puppies! The ladies had a great time rifling through the endless selection of jewelry and shoes, while the men could look through shops selling tools, plants, and anything else you can imagine! The highlight of the visit was the live snake shop! The bravest of the group stepped up to take pictures with the slithering creatures! It was quite a sight to see! On our way to our final stop, the Premium Outlet North, we played a special game of blackout BINGO. Jovi, the winner of this BINGO game received a $100 poker chip! As 4:00 PM rolled around, we pulled up to our last stop, the northern Premium Outlets. This mall boasts over 150 outlets like Kate Spade, J.Crew, Nike, and Michael Kors! We may have been fatigued from the dry weather and previous SEVEN hours of shopping, but arriving at a new mall gave most of us a new bust of energy. We shopped here for about an hour more before retiring with heavy eyelids and lighter wallets to our tour bus. The Broadcast Show was one of the most exciting events we had on this trip. Our special guests were truly out of this world! James of the Chippendales talked to the Morning Crew about being an entertainer and gave away tickets to the Chippendales show! Psychic Mystic Mona specializes in tarot reading and brought her cards to the show to give six volunteers a free consultation! Next up was a SURPRISE appearance by NATURAL VIBRATIONS! Natural Vibrations is an incredibly talented island reggae band based out of Hawaii. They are currently on tour in the mainland and made time to perform a couple of songs at our broadcast show. After their performance, the Amazing Johnathan took over the mic. He has a witty personality and gave the Morning Crew a run for their money! The Amazing Johnathan specializes in a unique type of illusion, and performs five nights of the week at Bally’s. During his interview, he gave away a copy of his practical joke book entitled, “Every Trick in the Book”. After the Amazing Johnathan, representatives from Trader Joe’s tempted us with their yummy goodies like Herb & Spice Popcorn, Nutty Bits, Peas on Earth, and more! Finally, we had a performance from HaleAmanO, an island reggae band based in Las Vegas. Although only two members of the group could make it to the interview, they talked about what it was like to live in Las Vegas and performed a couple of songs for us. They are definitely rising stars! To wrap up our Broadcast Show, we played a final round of blackout BINGO. The winner of this game received a $100 poker chip!! Top: Round One of the Slot Tournament begins! Middle: Norman tries his best to get a high score. Bottom: Member Dennis wins first prize in the tournament! Our final event was a friendly Slot Tournament after the Broadcast Show. The goal of the slot tournament is to score as many points you can in 20 minutes on your slot machine. The machines are chosen by a blind picking of numbers. The scores are tallied by the Big Kahuna Slot Tournament official, and the top eight winners were chosen! Our grand prize winner received $200!! We had such a great time on this year’s trip! We hope even more people join us next year! This entry was posted in CU News and tagged activities, california casino, chippendales, community, fun, hawaii, hawaiian tel federal credit union, hitelfcu, honolulu, island 985, kreyzoshiro, las vegas, magic, mainstreet station, members, money, mystic mona, party, poker chip, rorywild, slots, tailgate, the amazing johnathan, tournament, vacations hawaii, winner by Hawaiian Financial Federal Credit Union. Bookmark the permalink.